Non enveloped, large (50 nm diameter) icosahedral particles composed of 420 subunits T=7 symmetry. It has not been described whether handedness of capsid is laevo or dextro, here the pictures dsplays a laevo form. Monopartite, open circular, double stranded DNA of about 8000 base pairs with discontinuities in both strands: one in the transcribed strand and one to three in the non-transcribed strand. Codes for 5 proteins. Attachment of the viral proteins to host receptors mediates its entry into the host cell. RNA translation produces viral proteins. 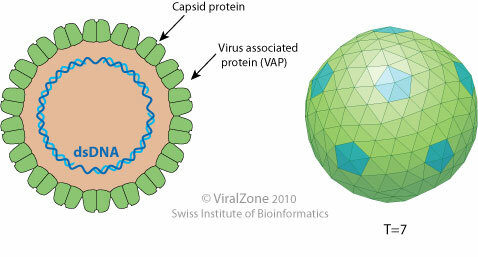 Genomes are encapsidated with capsid protein, releasing new virions. TRANSMISSION Mechanical inoculation in plant by insects.